Norman joined The Interface Group in June 2015 as a PhD student. He has a master’s degree in Mechanical Engineering ETH and reentered academia after five years working as software engineer for a Zurich based start-up. His research focuses on 3D-shape analysis of intracranial aneurysms with the goal to establish shape descriptors as image biomarkers for disease status. 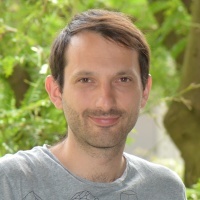 His project is carried out in a collaboration between The Interface Group and the Institute of Applied Simulation of the Zurich University of Applied Sciences (ZHAW). Norman contributes to the AneuX project whose primary goals are to improve the understanding of the formation process of intracranial aneurysms and to develop a knowledge database that will aid clinical decision-making.